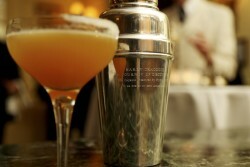 The Sidecar is traditionally made with cognac and is believed to have been invented around the end of World War I in either London or Paris. It was named for the motorcycle passenger seat. Put some lovely Plymouth Gin in it and it’s even better. Mix equal parts of Plymouth Gin, a triple sec such as Cointreau and fresh lemon juice.